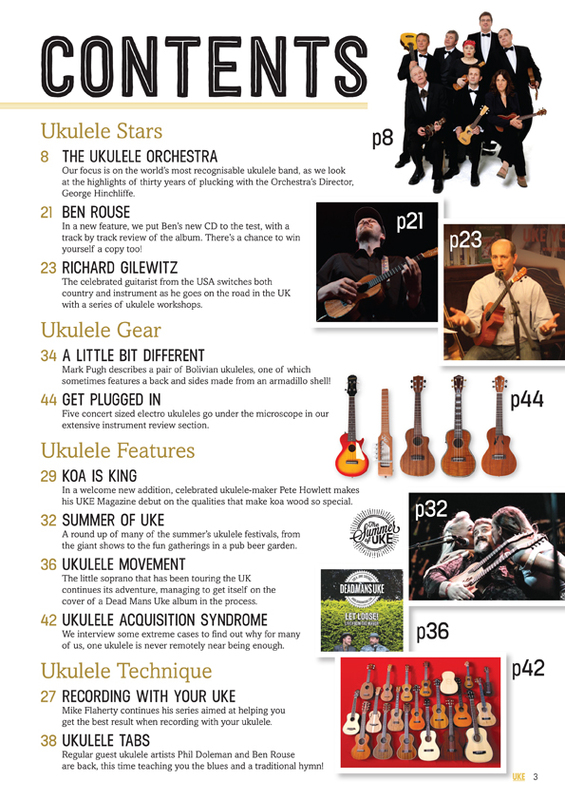 Our third issue, released in September 2015, is a special celebratory edition featuring the 30th anniversary of the Ukulele Orchestra of Great Britain. Their Director, George Hinchliffe gives us an entertaining history of the group, looking at their best and most unusual gigs, how they got together and their future plans. We are also joined by famous ukulele maker, Pete Howlett, in the first of a series of articles about the materials that make up our favourite instrument. We look at the Nano Uke, a miniature creation from Andy Miles, as well as some Bolivian ukes that are sometimes made using an Armadillo shell! Ben Rouse and Phil Doleman gives us some technical skills to learn, Nick Cody meets Shimo, a Japanese master builder, we follow the journey of the travelling ukulele and get up close and personal with five concert electro ukes. All this and much more as UKE Magazine goes from strength to strength. 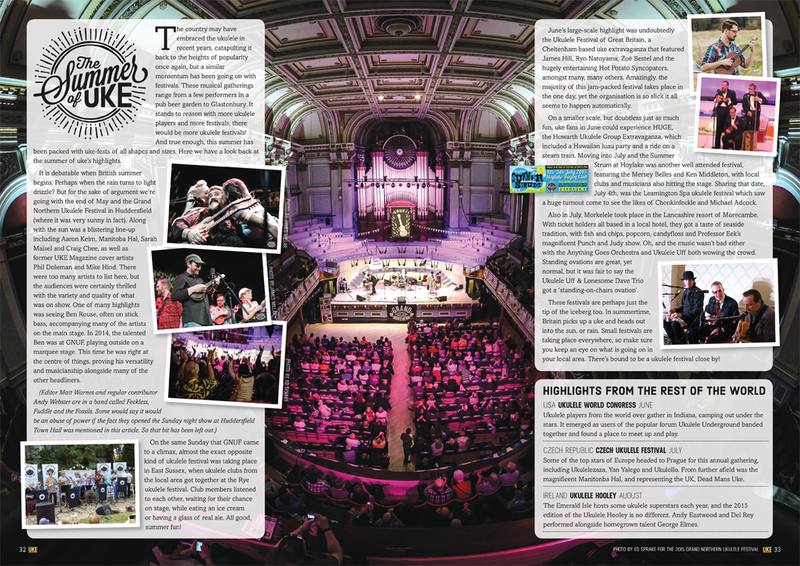 Our focus is on the world’s most recognisable ukulele band, as we look at the highlights of thirty years of plucking with the Orchestra’s Director, George Hinchliffe. In a new feature, we put Ben’s new CD to the test, with a track by track review of the album. There’s a chance to win yourself a copy too! 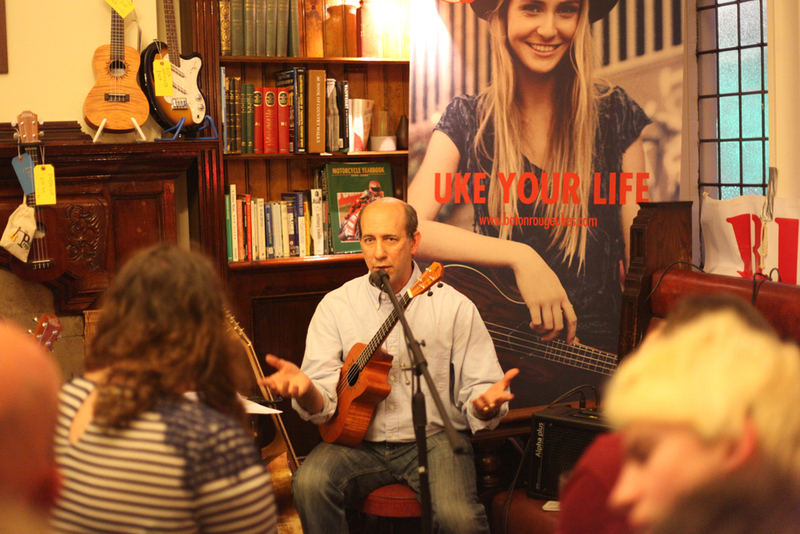 The celebrated guitarist from the USA switches both country and instrument as he goes on the road in the UK with a series of ukulele workshops.